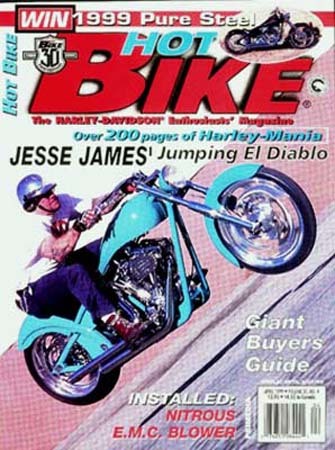 Our first cover bike for Jesse James West Coast Choppers. Simo was waiting during this jump with his cellphone dialed 911, and his finger on send. Jesse pulled it off without any problems. As soon as we repainted the seatpaint that got the paint burned off of it from the rear wheel hitting the fender on landing,..hehheh.